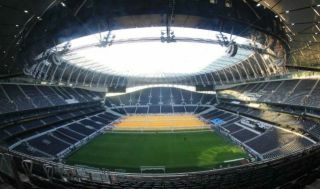 Tottenham are reportedly ready to ban fans from their first game at their new stadium against Crystal Palace on April 3. Spurs supporters have waited a long, long time for the opening of their new ground, and it seems some may not even make it to the first game due to concerns over illegal ticket touting. A report from the Sun today claims there has been a big issue with some touts trying to flog tickets for the Palace game for as much as £1200. A club statement read: ‘Season-ticket holders or anyone else selling their tickets on social media platforms and other unofficial websites are in breach of the club’s terms and conditions, therefore leaving themselves liable to having their accounts suspended. Tottenham fans will no doubt be desperate to get to the game, but it’s clear they must do so via the legal and proper route or they won’t get in at all.